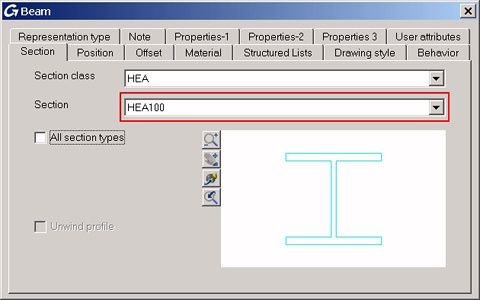 When creating an I-section beam, the section, by default, is for example an HEA100 (depending on the installation). In order to change the default , you need to go to the Management Tools ("Start the Management Tools" icon from the "Standard" toolbar), go to the "Default sections" category and search for the "Default section for I - Sections" default. As an example, we would like to define the UB203X133X25 as the default "Section" (this section belongs to the "SA Universal beams" section class). Instead of HEA nach DIN, we have to enter the (internal) table name of the "SA Universal beams". To determine the internal name, open the "AstorProfiles2009.mdb" database and go to the "ProfileMasterTable" table, then note the name in the "TypeName text" column. Note: you can copy-paste it. Keep the "#@§@#" as the separator. Instead of HEA100, we have to enter the UB section name (of the SA Universal beams). Close the "ProfileMasterTable" table and go to the "EXT_SA_UniversalBeam" table, then copy (or enter) the section name (in the "SectionName" column) you want to use. In our case, it is UB203X133X25. Then click "Load settings in Advance" to save the changes and go back to Advance Steel. The next time you create an I-section beam, the default "Section" will be UB203X133X25 as we just defined.